Sutherland JM, Hellsten E, Yu K. Bundles: An opportunity to align incentives for continuing care in Canada? Health Policy. 2012;107(2-3):209-217. Birkmeyer JD, Gust C, Baser O, Dimick JB, Sutherland JM, Skinner JS. Medicare payments for common inpatient procedures: implications for episode-based payment bundling. Health Serv. Res. 2010;45(6 Pt 1):1783–95. Sutherland JM, Hellsten E,Yu K. Building bundles in Canada: Examining regional variation in total joint replacement using an episode of care lens. Patient Classification Systems International 28th Annual Working Conference, Avignon, France, October 2012. Hussey PS, Mulcahy AW, Schnyer C, Schneider EC. Closing the quality gap: revisiting the state of the science (vol. 1: bundled payment: effects on health care spending and quality). Evid Rep Technol Assess (Full Rep). 2012 Aug;(208.1):1–155. Sood N, Huckfeldt PJ, Escarce JJ, et al. Medicare's bundled payment pilot for acute and postacute care: analysis and recommendations on where to begin. Health Aff (Millwood). 2011; 30(9): 1708-1717. Bundled payments are a recently-developed, alternative method for funding healthcare services. Bundled payments are a funding method in which a single funding amount is used to fund the total amount of care related to a condition or medical event for a fixed time period. A bundle of care encompasses all aspects of a patient’s care across multiple providers and settings, over a fixed period of time, including pre-acute, acute, and post-acute care spanning healthcare settings and providers. A ‘bundle’ is defined as the set of treatments or services provided to a patient over a pre-defined timespan, or ‘episode’. For example, if a patient has a joint replacement, the bundle of care could be all care provided during an episode, from entering the hospital to 90 days after discharge. If the cost to providers of treating a patient is more than the set funding amount for the bundle, providers must cover the difference; if the cost of treating a patient is less than the set amount, providers keep the surplus. This arrangement gives providers the incentive to deliver efficient, effective, and high-quality care to avoid costly readmissions and re-hospitalizations. The goal of bundled payments are to increase the coordination of care across the continuum of providers and settings, reducing fragmented and siloed care, which lowers the quality of care delivered to patients (Spehar et al., 2005). The organizational structure created by bundled payments links providers in a way where each one is held accountable by their peers for the cost and quality of care they provide to patients during an episode. Bundled payments are not a funding method that is currently suitable for all conditions. Bundled payments are best suited for conditions or procedures which have clear clinical pathways. 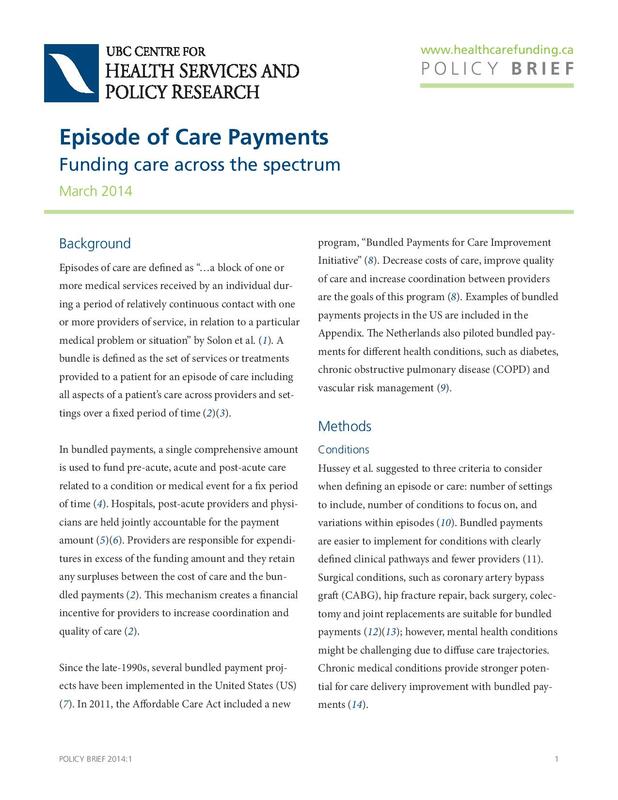 Bundled payments are less suitable for complex cases that have a variety of possible clinical pathways and costs as well as procedures with low volumes, or few providers of care (Struijs & Baan, 2011). As with many funding policies, accurate, timely, and linkable data must be available across all healthcare settings to properly establish a proper bundled payment amount.